Kids need good sensory processing skills in order to learn and behave well. This easy to read article from children’s occupational therapists in Sydney’s northern beaches is a helpful guide for parents and teachers. There is a state of alertness that can be considered optimal for your child’s learning. In this state, your child is alert and attentive, their muscles are not droopy, and they can concentrate with little effort. Ideally, this is the state you want your child to be in most of the time, especially when he or she is required to learn at preschool or school. By learning about self-regulation, you and your child’s teachers and carers can work together to keep your child’s ‘engine’ running well and so support their learning and behaviour. For most of us, it’s impossible to attain a ‘just right’ level and stay there all day long. ‘Just right’ is a range in which our brains and bodies function best for different tasks. To learn and behave well, your child’s body needs to be in this ‘just right’ zone, and that’s what we, as Occupational Therapists who support children’s sensory needs, teach kids how to do. We help them learn to adjust their ‘engine’ levels so that they can reach their academic, social and emotional potential. Your child’s brain needs stimulation in order to concentrate and perform well. The old adage, “sit still and pay attention!” is not physiologically possible. Our bodies can sit still OR pay attention, but it’s rare that they can do both at the same time…and this is particularly the case with children! How can you set your child’s brain up for success? The bottom part of the brain (brainstem), the back part of the brain (cerebellum) and many other parts of the brain are stimulated through ‘heavy work’ to the muscles and joints. Typically, heavy work activities that pushing, pulling, lifting, hanging, climbing, tugging or towing. Why is heavy work important? When your child’s muscles and joints participate in the right kind of activities that involve pushing, pulling, lifting, hanging, climbing, tugging or towing they are better able to manage their ‘engine’. So, if your child’s engine runs faster in the presence of distractions like noise, movement, tastes or even feelings like frustration, excitement or disappointment, heavy work can give a ‘chill out, it’s okay’ message to their brain so that they can re-focus on what they need to be doing and also keep their emotions in check. In the same way, if your child’s body is under-reacting to situations and just can’t get it together to perform everyday tasks, heavy work can help them to achieve a balance between high or low states so that their body and brain can ‘wake up’, think, react and behave in a calm and organised manner. A movement break, including heavy work, is often the most effective way to help your child alter their engine level when it is in ‘high’ or ‘low’ gear. Heavy work can be offered to the whole body, or just parts of it. As occupational therapists, we frequently support children whose engines need a ‘tune up’ and often recommend activities like tug of war games or fidgeting with putty to stimulate the muscles in kids’ hands and arms. This can send a calming message to their brain and help your child to function better. Chewing gum, eating crunchy foods or slurping thick drinks through a straw are also very effective ways to give heavy work to the muscles in your child’s jaw. These are particularly helpful if your child is at preschool and school and needs some ‘input’ during the day to keep their engine running at the right level. These five ways to change engine levels can be a good start when developing a ‘sensory diet’. Just as your child’s body needs a healthy nutritional diet, their ‘sensory diet’ describes their brain’s need for sensorimotor input (from touch, sight, hearing, taste, smell or movement). Without input from their senses, your child’s brain experiences what could be considered a type of ‘sensory deprivation’. If you and your child’s teachers and carers can provide your child’s brain with its needed sensory diet, your child will feel alert and attentive. Each person has his or her own unique sensory diet formula. The amount and types of sensorimotor activities or environments needed to stimulate the brain and body differ from person to person. An occupational therapist with experience and expertise in supporting children’s sensory needs can help you to determine the right activities for your child’s sensory diet. A starting point for you as a parent is to become a keen observer of what supports and what compromises your child’s optimal functioning. In other words, what activities or situations get your child’s engine running to the point where they have lost the ability to think and behave calmly. Once these things are identified, your child’s occupational therapist can develop the right sensory diet for your child, so that you and your child’s teachers will know which routines will be the most successful and at what time of day your child should participate in them. • What does your child already put in their mouth? Does your child show a preference for crunchy foods or chewy food? Does he or she prefer bland, ‘white’ foods like pasta and rice, while avoiding foods with a strong smell or texture that needs to be chewed? Do they chew on their pen tops or on the cuff of their shirt sleeves while concentrating? • What kind of movement does your child commonly prefer? 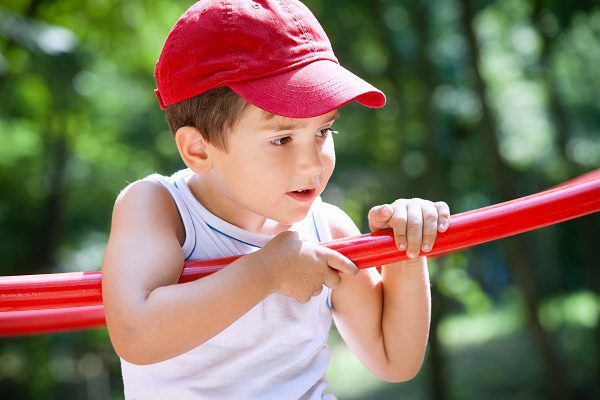 Does your child love to spend time swinging? Do they walk or pace while talking? Do they like to watch TV, draped upside down over a sofa? Does your child like to bash and crash into walls, objects and other people? • What kind of things does your child prefer to touch? Does your child tap their pencil on the table while thinking? Do they love to snuggle underneath a pile of heavy blankets or with a favourite stuffed toy? What kinds of clothing textures do they prefer to wear? Do they dislike tags on clothing, socks or shoes? • In what type of visual environment does your child work best? Does your child tend to work best when their desk is cleared of all clutter, or do they seem to like to “nest” with lots of paper and objects around them while they work? Do they decorate their bedroom with lots of bright, colourful wall hangings, or do they prefer few visual distractions? • How much and what type of auditory input seems to support your child? Does your child prefer to listen to rock music while they do their homework, or would they rather study in silence? Depending on the task, is there a difference between your child’s preference for silence or music in the background? Do they like to listen to music when they are learning new maths concepts or only when they are completing their maths practice sheets or other familiar worksheets? The answers to these questions will help you to identify what strategies your child is currently using to keep their body alert or calm. If you feel that your child might have sensory sensitivities, but are uncertain about what to do next, contact an Occupational Therapist with experience in the area of sensory processing for support. Need help to get your child’s engine running well? Kids First’s friendly occupational therapists in Sydney’s northern beaches have years of experience supporting children who have sensory needs. With the right help and advice, you and your child’s teachers and carers can make it easier for your child to learn and behave well. Find out more about how Occupational Therapy at Kids First can help your child when you click on the image below, or contact us on (02) 9938 5419 to arrange an appointment to discuss your child’s needs with a member of our occupational therapy team.